The Flying Dutchman Funicular, also known as the Cape Point Funicular, is a funicular railway located at Cape Point. It’s the only commercial funicular of its type in Africa, and takes its name from the local legend of the Flying Dutchman ghost ship. The ghostly galleon known as the Flying Dutchman has been immortalised by mariners’ accounts and by a number of sightings over the past three-and-a-half centuries. As legend has it, the Flying Dutchman was captained by a Dutchman, Hendrik van der Decken, and was headed home from Batavia (now Jakarta) to Holland in 1641. As Van der Decken approached the Cape, typically stormy weather shredded the ship’s sails and waves flooded the deck. The captain had rounded Cape Point on several occasions previously, but this time, a terrified crew implored him to turn back. He refused to submit to the elements and lashed himself to the wheel, swearing that he would sail around Cape Point, even if it took him until Doomsday. recommended even outside of peak season. The Food Shop has a variety of light take-away meals and refreshments for those wanting a quick, casual bite to eat. A selection of sandwiches, pizzas, coffee and snacks is available and visitors can enjoy their meals in the outside seating area. 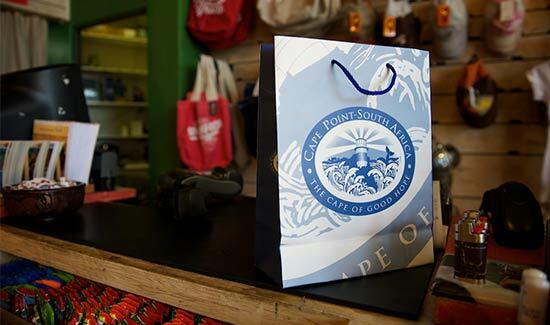 The Cape Point Logo Store is the ultimate souvenir shop at the Point. Visitors can choose from a wide variety of merchandise branded with the Cape Point logo, from T-shirts and fleece tops, caps and hats, mugs and teaspoons, to key rings, magnets and books. The Cape Point Certificate – the official record of a visit to Cape Point is sold here. Everyone will be able to find a memento to take home as a reminder of their visit to this beautiful place. Cape Point falls within the Table Mountain National Park and it is the natural beauty and diversity of the floral kingdom that is celebrated in this store. Visitors can purchase bath and body products made from uniquely African extracts like rooibos and aloe; take home their own protea seeds or buy books to guide them through the flora and birds of the area. African heritage is also recognised in locally made bright ceramics and cloths. Clothing and accessories for adults and children complete the picture. Lighthouse Five reflects maritime history and has a distinctly nautical feel with rich dark wood fittings and polished brass. Visitors can buy ship wheels or brass bells; or take home an intricate replica of an old sailing ship or an ostrich egg decorated with old maps. Great white shark posters, shark tooth jewellery, DVDs, globes and Ngwenya glass figurines are just a few of the treasures to be found. For the kids there’s a range of soft and cuddly marine toys, bright accessories and clothes.